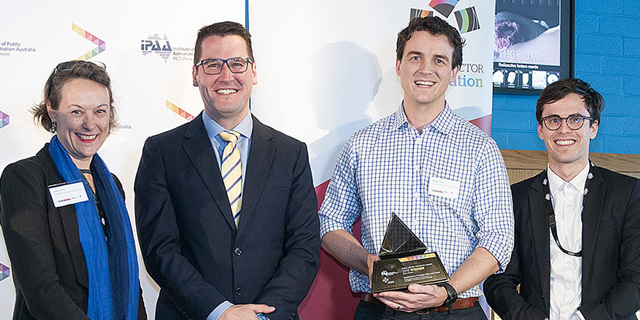 Congratulations to Dr Michael Nunan who, along with his team at the Department of Foreign Affairs and Trade, won the Digital and Data award at the 2018 Public Sector Innovation Awards. This prestigious award, presented by Senator the Hon Zed Seselja, the Assistant Minister for Science, Jobs and Innovation, was for the ‘Tupaia’ program which uses digital technology and human-centred design to deliver improved medical and health care facilities to developing nations across the Pacific. The program stems from Michael’s PhD project "Beyond the Essential Medicines List: improving access to essential medicines at the primary healthcare level in Solomon Islands through the implementation of mobile electronic inventory” undertaken in the Department of Paediatrics, supervised by Trevor Duke, Andrew Steer, Andrew McLachlan, Divinal Ogaoga, Gregory Dunkan. A fantastic achievement by Michael and all those involved in this innovative program.